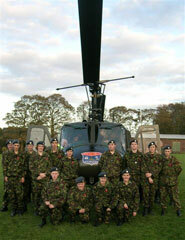 Earlier in the year we were contacted by Fl Sgt Will Bruton of Kirkham Grammar Combined Cadets Force. 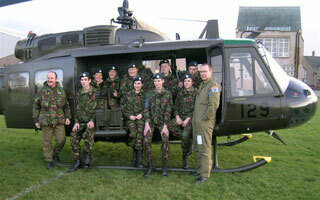 Will is one of two senior cadets who organises the RAF sections activities. 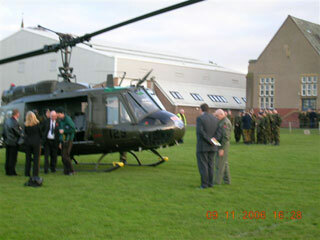 The school was founded in 1549 and is only about a mile from our house so the cadets had seen and heard the huey flying around a lot. 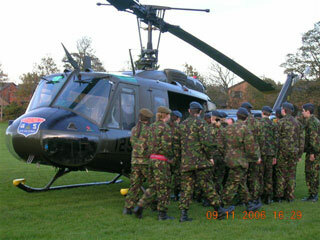 The CCF has been at the school since the 1950's and consists of an RAF and an Army Unit; in total over 300 cadets and about 10 staff, most of whom are teachers. 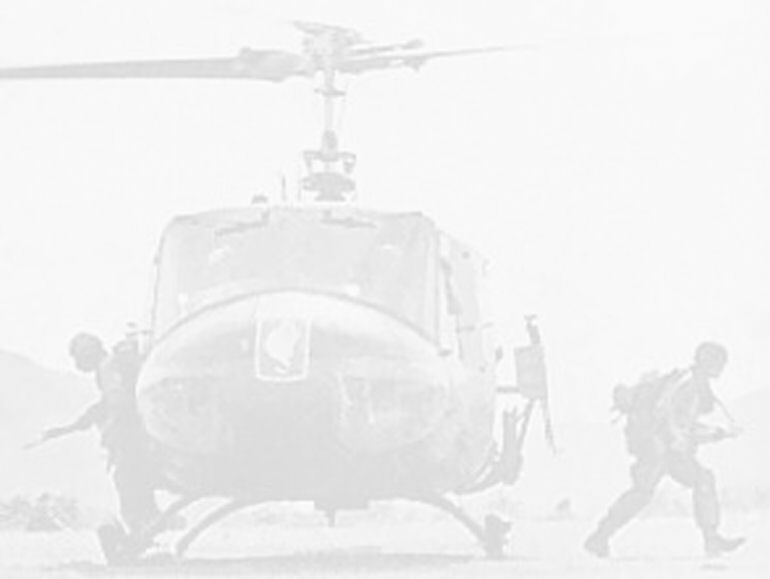 The RAF unit has opportunities for experience flying at 10 Air Experience Flight RAF Woodvale in Grob Tutor aircraft and motor gliding in Grob 109B Vigilant motor gliders near Blackburn. 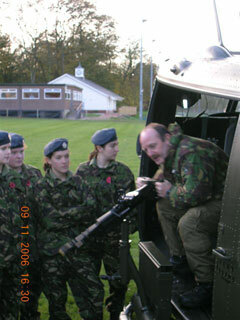 Activities available to cadets include; annual camps to military bases, adventurous training, shooting, and flying training including scholarships towards fixed wing PPL. 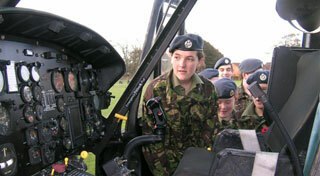 Will asked if the cadets could have a close up look at the machine and of course we were happy to oblige! 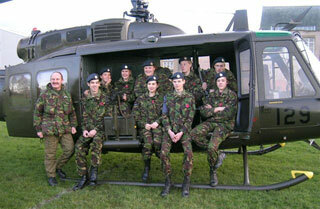 The crew were due to do their monthly flight tests so we combined the two and “dropped in” to the school. 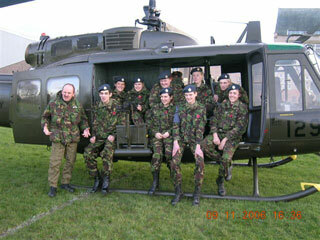 Also visiting the school that day was another “Old war bird”, Freddy Hudson an Old Boy of Kirkham Grammar School . He had attended to present a signed copy of his book "Loyal to the End", along with the original manuscript to the school archives and library. 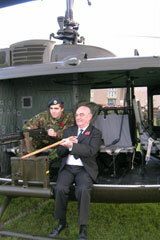 This was his first return visit to his old school in over 50 years. 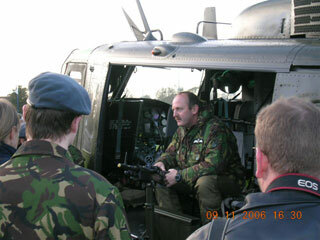 They were all very enthusiastic and eager to have a close up look at the helicopter! 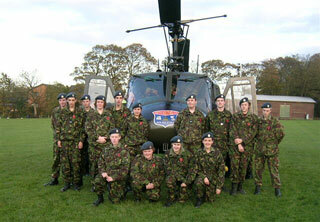 Pictured below are Fl Sgt Will Bruton and Freddy Hudson and just a few of the cadets! Thank you to everyone involved at the school, especially headmaster Mr. Douglas Walker and Col Ian Scott, Contingent commander, for inviting us!